Coniglio was priced at $712K to start 2018 after playing 7 games and averaging 95.7 in 2017, effectively making him ‘underpriced’. The 10.19% of coaches who started him last year would’ve been pleased with his score of 146 in round 1, consisting of 32 disposals, 8 marks, 7 tackles and 2 goals. Coniglio certainly exceeded his expectations, averaging 110.4 from 21 games and was the 5th highest averaging midfielder. With plenty of bargains available in the midfield, you’d need pretty good reason to pick someone like Coniglio who appears to have hit his peak in terms of AFL fantasy. The obvious ‘uber’ premium in the midfield is Jack Macrae, and righty so. But coaches will also be questioning his price and whether paying close to $1 million is worth it. Slightly cheaper at $801K, Coniglio can be identified as a consistent, durable, safe and a well-rounded fantasy player, who could be the alternative to picking Macrae. He averaged over 110 for the first time in his career after managing 103.4 in 2016. His lowest season average over his 7 year career is just 76.3. Focusing on 2018, ‘Cogs’ went 110+ in all of the first 5 games and 12 times across the whole year, including a career high of 152 in round 23. In round 11 he went down with a head knock on 106 and only played 68% TOG, but had the bye the week after to recover. He went over 120 on 6 occasions and 140+ three times. On the flip side, His lowest score came in round 14 where he scored 71 against the Lions. He went below 100 in 6 games, 4 of which were still above 90. Something else to consider is the departure of Dylan Shiel. Coniglio seemed to escape the tag in previous years and Josh Kelly was often the second option to eliminate after Shiel. I can’t guarantee anything, but I reckon Kelly will be the main target by oppositions in 2019. Coniglio often started in the forward line, or spent time there to give others a run in the guts, evident with his career high 24 goals scored in 2018. I don’t think the Giants can afford to have him down there with Shiel gone. Coincidently, the one game Shiel didn’t play, Coniglio scored 144 and spent the most time on ground (93%) for the year. It’s a small sample space but is encouraging signs for Cogs. Coniglio doesn’t have too much downside, barring 2017 he is durable, consistent, has a good ceiling and has a natural talent of finding the ball. But the big question we ask with premiums like him is; “will he improve enough?” Being priced at 110, he is near his ‘maxed out’ price and unless you see him averaging 5+ more points than last year, he holds no value and is just a boring, standard, safe pick. Someone like Crouch or Ross around a similar price have 5-10 points potential upside in 2019 due to injury and/or form in 2018. Another concern would be a tag from opposition teams. In recent years, Shiel and Kelly have been the obvious targets, as well as Whitfield at times last year, but with Shiel gone, it poses the question of who to tag? After Coniglio’s amazing year, he could cop some attention from taggers. GWS face Essendon, West Coast and Richmond to start the year, Hutchings the only real threat. Personally I don’t think he will get tagged and Whitfield and Kelly will be the main targets, but I can’t be certain and it’s in the unknown. 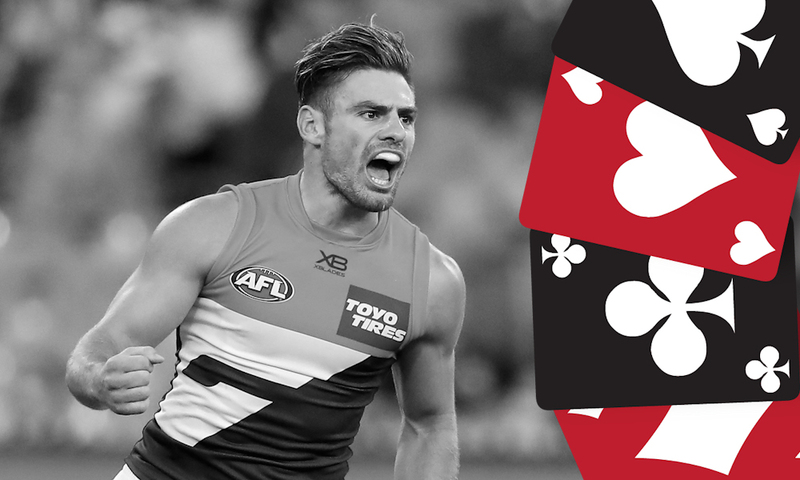 QUEEN – Midfield spots are very tight at the moment with Tom Mitchell going down, and Coniglio is a cheaper alternative owned by just 3% of coaches on the DT Drawing board. The point as to whether he holds ANY value is valid, although I think the numbers show that he can advance from his 110 average, and look at 115 or even higher in 2019. Coniglio is nowhere near a must have, but provides a safe, consistent option in the. Midfield who is a season keeper and a likely top 8 midfielder. What does Coniglio average this year? Well very written DODT. Doesn’t hype up the player and say he’s a must have like other articles! Gets to the point which is nice. Not a must have for me, rather an upgrade target. Surely will pick up a few of Shiels points? Just a note on the game without Shiel – the reason his TOG was so high was because GWS basically had no bench due to injuries. It was the game where GWS decided to play with 16 on the field. Also, Ward and Kelly cracked 140 that game and it was a 100 point thumping so I wouldn’t necessarily read into it too much. queen? same rating as worpedo? after last year? that would explain the oregano drought.